Playtime is a great opportunity to explore and learn, but not at the risk of serious injury. To limit the risk of harm to children, play areas need to be designed with an awareness of where the risk is greatest. 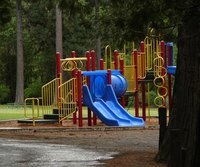 Fall zones, also called use zones, are the areas beneath and around playground equipment where children are most likely to fall and sustain injuries. Once identified, fall zones should be equipped to protect children against playtime injuries. Calculating a fall zone is the first step to creating a safe, playtime environment for your children. Measure the height of the slide. Measure 6 feet outwards from all points on the edge of the slide, and mark the ground at this distance from the slide. If the slide is less than 4 feet in height, draw a perimeter marking around the slide by joining the markings made 6 feet from the edge of the equipment. The area enclosed by this perimeter is the fall zone for small slides. For slides that are higher than 4 feet, measure the height of the slide at the platform found at the top of the steps and the top of the sliding surface. Add 4 feet to the platform height to obtain the distance which the fall zone should extend beyond the foot of the slide. For the remainder of the fall zone, excluding the foot of the sliding surface, the zone perimeter must be 6 feet from the slide sides and the access steps. Measure from the ground to the pivot point of the swing. Multiply this measurement by two to obtain the distance that the swing's fall zone should extend in front of, and behind, the seat of the swing. Measure 6 feet to either side of the swing support structure and mark the side boundaries for the fall zone of the swing. Measure 6 feet outwards from the edge of the piece of equipment. Mark these points of measurement on the ground. Join the markings on the ground to create a perimeter around the piece of equipment. The area enclosed by this perimeter is the fall zone for the piece of equipment.